(Detroit, Michigan – February 8, 2019)-Some of the biggest names in music have been nominated for the National Rhythm & Blues Hall of Fame Class of 2019. The ten (10) artists with the most votes will be selected to join the Class of 2019. Winners will be announced March 1. The ceremony will be televised, and will take place on June 23rd in Detroit, Michigan. 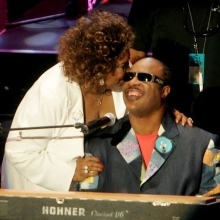 Stevie Wonder, Aretha Franklin, Gamble & Huff, Mary J. Blige, Peabo Bryson, Berry Gordy, Stephanie Mills and The Isley Brothers are among the impressive list of nominees. Some of the past inductees like Motown legend Martha Reeves of the Vandellas and this year nominees and their family members plan to attend the announcement on March 1. The late great Queen of Soul Aretha Franklin was inducted into the 2015 class, this year she is nominated as a songwriter. The host for this year’s ceremony will be Motown legend former member of The Supremes the legendary Mary Wilson. The National Rhythm & Blues Hall of Fame has included over 200 R&B legends since 2013 from Prince, The Temptations, Michael Jackson, James Brown, Elvis Presley, Chubby Checker, Whitney Houston. Tickets will go on sale for the 2019 8th Annual National Rhythm & Blues Hall of Fame Black Tie Induction Ceremony at Eventbright and Ticketmaster on March 1, 2019. Also planned for the Rhythm & Blues Hall of Fame Weekend is the 8th Annual Per-Induction Ceremony Celebrity All-White Party@ Bert’s Entertainment Complex, on June 22.